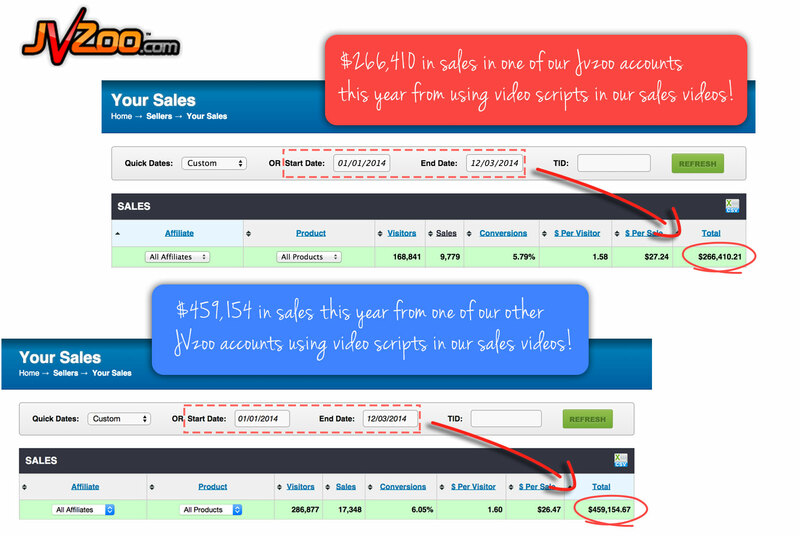 ... That have helped generate over $650,000 in sales this year! We've Made Video Script Writing Simple! ... It sounds like you're either the cheesiest sales man on the planet, or you create a story which makes your viewers feel like they need a strong expresso, just to stay awake! If you feel like that, then I can tell you, YOU'RE NOT ALONE! And that is why we decided to do something about it! We decided to come up with a solution which would enable absolutely ANYONE to create engaging and compelling video scripts within a matter of minutes! What Is The Main Point Of My Video? And that is why we are super excited to bring you the most powerful & flexible video scripting all-in-one solution! Creating Video Scripts In Minutes Is Now Possible! Once you have created your video script, you can now easily pubish your script into a microsoft word document or as a .PDF. Then you can either record it yourself or send it to an outsourcer on fiverr or voicebunny. To make things even sweeter, we have decided to release videoscript at a really amazing discounted price to give you complete freedom to enjoy the power of creating high quality videos scripts without having to pay a fortune or any monthly fees! So make sure to get access right away as the price is increasing significantly in the next few days! 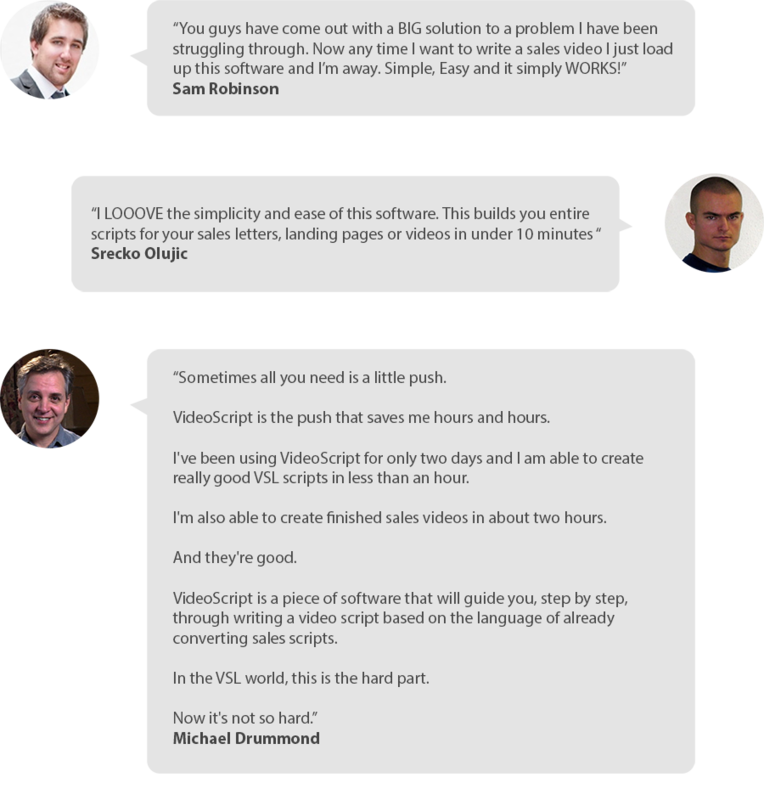 We’re so absolutely sure that VideoScript will help your online business that we’re offering an unconditional, NO-question-asked 30-day money back guarantee. If for whatever reason VideoScript does not satisfy you in any way, simply send us an email within 30 days from your purchase and we’ll refund you right away! So, if for any reason you’re not happy, you can get your money back within 30 days. Simply contact us. No monkey business. We will always refund your money. 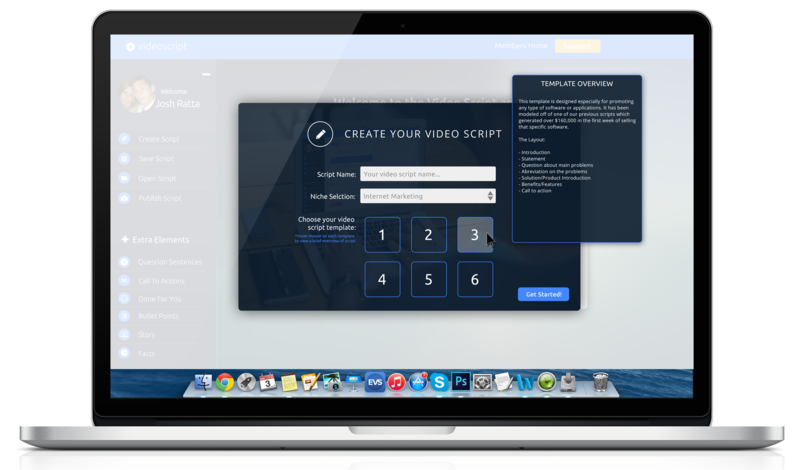 Give VideoScript a Try right now! Is Video Script compatible with both Mac & Windows PCs? Yes! 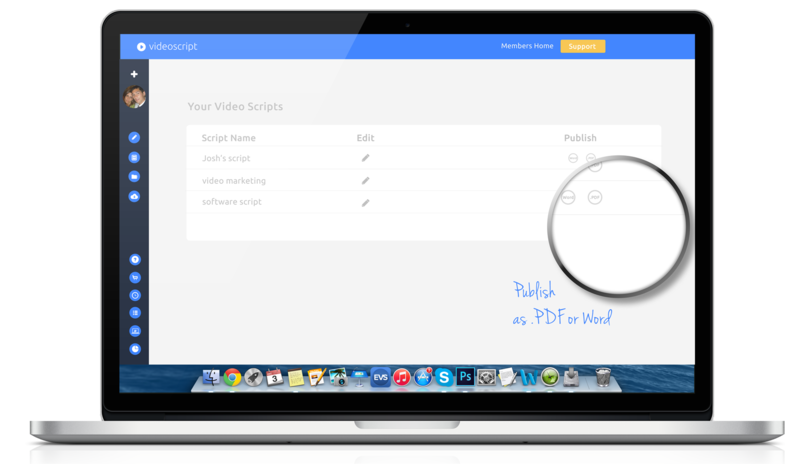 VideoScript is an online based software application, meaning you don’t need to download or install anything! You can simply login to your account and use it whenever and wherever you want! 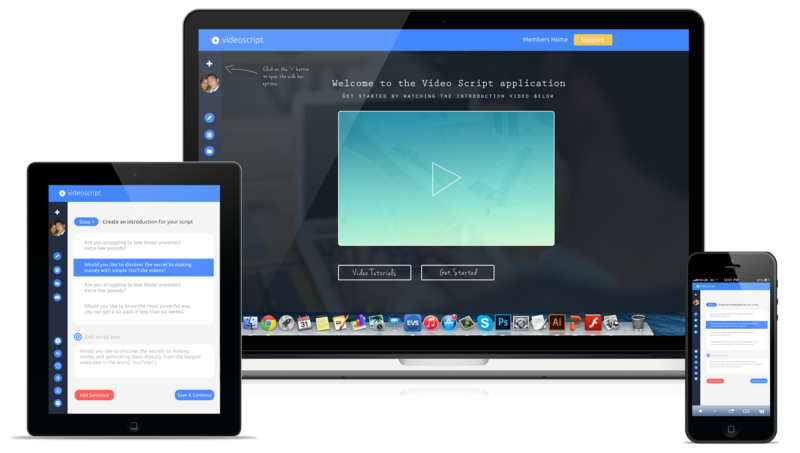 Does videoscript work on mobile devices & tablets? Yes, we developed video script to make it compatible for all devices. 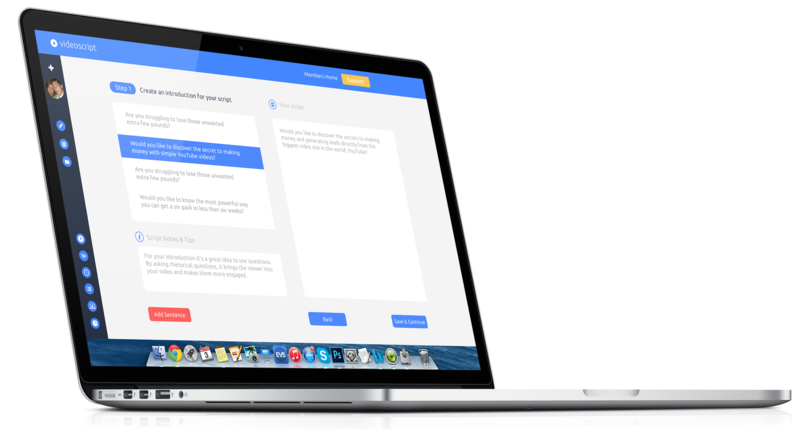 So if you’d like to build a video script on you iPad or Tablet or even mobile phone, you can do so, the choice is yours! Yes, we have a full-time support desk which recently had a satisfactory score of 100%. We pride ourselves in having short response times and will do our best to ensure you are happy with your purchase! Is video script a monthly recurring payment to use this application? Absolutely not! It’s a one-time fee to use this application and create an many scripts as you like! How does the pricing packages work? The starter package comes with one general online marketing template. The silver package comes with 4 general online marketing templates. 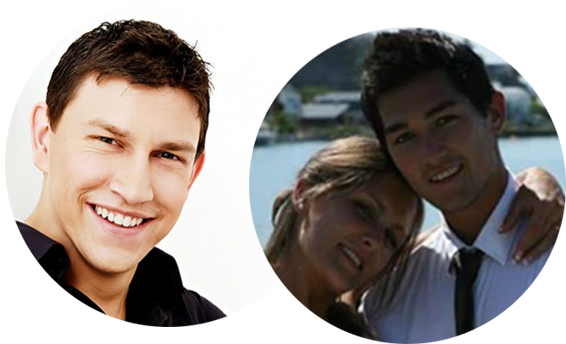 The multi niche template comes with 6 general online marketing templates and 3 other most popular niches including; Fitness, Weight Loss & Dating. Is there video training & tutorials? Yes! Although video script is super simple to use, if you have any questions on how to create your scripts with our application, you can either go through our easy to follow video tutorials and/or even download the video script template guides which come with every template!